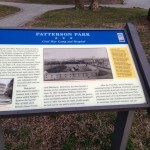 Patterson Park is a 137-acre (55.26 ha) park and recreational area in southeastern Baltimore, and a just few blocks from my condo in Canton. 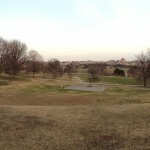 The northwest corner of Patterson Park is its highest point and is called Hampstead Hill. 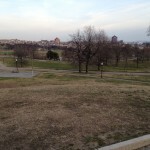 This was the site of the American defensive line during the Battle of Baltimore, the war of 1812. 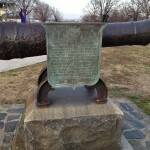 The guns at Ft. McHenry held off the British ships (The Star Spangled Banner was written at this time), making it impossible for the ships to support the land invasion from the east. Still the 10,000 American defenders were driven back to the defenses in Hampstead hill and the 100 cannon emplaced there before the British commander decided that—without naval support—the battle could not be won and retreated. 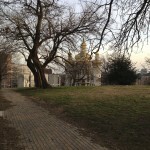 Patterson Park is also the place of an important scene in one of my future books, DISOBEDIENCE. Before I left the city in July 2013, I made sure to walk along the paths, once again, where different scenes I intended would happen in Baltimore. It’s important to get a sense of the feel of where things happen, not just the events themselves. 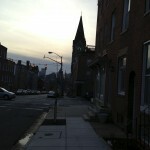 I attached a few of photos from one of my walks here. Disobedience takes place mostly in present day Baltimore, although there are parts of the book that happen in Rome, between 1880 and 1920, and in Provence, France from 1920 until the outbreak of World War 2. I spent two and a half months in Rome this past winter, researching the changes that happened in a part of the city and plan a trip to Provence this next spring. There is a part that happens in Boston as well, but it’s short and mostly at night. Disobedience is a supernatural thriller. I started the novel well before leaving Baltimore, but put it on hold until after I AM is completed next year. I AM, my next book—after The Balance—is a science fiction story, also started some time back. 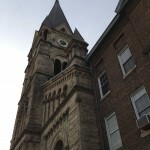 St. Michael the Archangel Ukrainian Catholic Church, just across Eastern Ave from the park. Baltimore had, and still has to an extent, ethnic neighborhoods, although they are less pronounced and much changed. There’s a Ukrainian club in Canton and there’s a little Italy between Fells Point and the Inner Harbor and a Spanish area in north Fells Point. If you look just to the right of the church, behind and above the streetlight in the park, in the distance, you can see the building where my condo was. 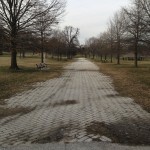 This is a path in Patterson Park, headed north. The area under the tree on the left, where the two benches are located, is in the book—the scene of an important violent event. The park slopes downhill to the sharp right. Hampstead hill is forward and to the left. 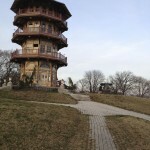 The Pagoda (not a part of the battle) was built as a place from which to look at the city—there’s a nice view from up there. 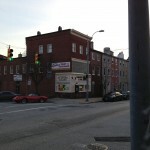 Baltimore still has corner stores with family homes above in the older neighborhoods.